In an interesting turn of events, it looks like photo sharing app Instagram has blocked startup Followgram for scraping the app’s data without their consent. Followgram was developed to add a web interface to Instagram photo sharing, which has been restricted to mobile apps for now (with the exception of when users Tweet or share photos via Facebook or Flickr). Using an RSS feed, Followgram users could access their Instagram photos online and share their profile with other users. The site also included the ability to browse other Instagram users’ photos as well. We wrote about Instagram.tk last weekend, which displays photos uploaded to Twitter using Instagram in real time. Every time you refresh the page (or click on Shuffle) a new image published by an Instagram user appears. Instagram.tk is pulling these pictures from Twitter search (when users Tweet out their Instagram pictures) as opposed to Instagram. While it doesn’t appear that Instagram has shut down this startup yet, a disclaimer was added recently on the top of the site, This site is not owned, affiliated, or officially supported by Instagram (Burbn, Inc.). But it could only be a matter of time before Instagram.tk is shut down as well. Of course, no controversy in the tech world is complete without a requisite Quora thread, and the Followgram site points to this one if visitors want to comment on the shut-down of the startup by Instagram. Followgram developer Herman Schutte writes, Yes, the website was in violation of their terms of service and I probably shouldn’t have used their API. But I also think that with the current start up boom, companies like Instagram should not wait this long before releasing a public API. As to whether Instagram is right or wrong for blocking Followgram, commenters seem to be mixed. The gist of the commentary seems to sum up to this: While Followgram’s scraping was illegal, Instagram needs to release an API soon to keep up with consumer demand for related services. Especially since there are some elements lacking from Instagram’s platform (i.e. a web interface), there is an ecosystem that could be built off the enormously popular photo sharing app. 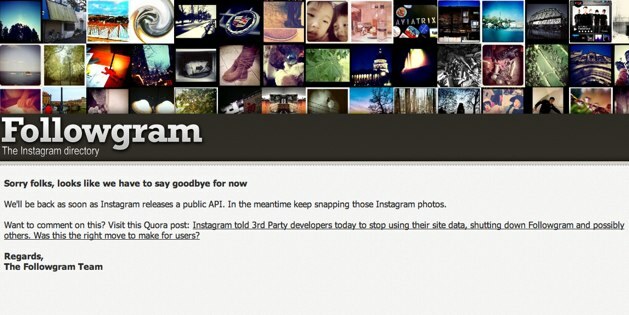 On thing is for sure—when Instagram does eventually release an API, Followgram will be first in line.